These are smaller printed versions of your slides which can be printed 2, 3, 6 or 9 slides to a page. They can provide useful backup material for your audience and can also be customised with your company name and logo. 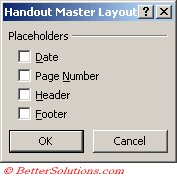 In PowerPoint 2000, you can now print your handouts with 2,3,4,6 or 9 slides per page, horizontally or vertically.